As I have mentioned before on CAD, ceramics is not the greenest of art forms, but it is nice to know that, with a little effort, potters can reduce their carbon footprints. One way to do this is to reduce your firing temperature. But what if you are hooked on high-fire reduction firing? Erik Haagensen and Luba Sharapan, the owners of MudFire Clayworks and Gallery, had started to fire cone 6 reduction because of a defect in the kiln they’d purchased, but after seeing the results they had no reason to change back, even after the kiln was repaired. As John Britt points out in the following excerpt from Ceramics Monthly, firing to cone 6 is cheaper, faster, and the results are almost indistinguishable from high fire. – Jennifer Poellot Harnetty, editor. This bowl with Malcolm Davis Shino Glaze was fired to Cone 6 in reduction. There seem to be a few obstacles in getting potters to convert to the idea of mid-range firing. First, there is the inertia of their current practice. Change is hard in spite of the obvious benefits, especially if you have been doing the same thing for 20 years and it is working. Also, there is an underlying belief, although it is completely incorrect, that cone 10 is superior to mid-range or low-fire, and changing this mind set is an educational challenge. I think that this comes from the long historical European search to imitate Chinese high-fire porcelain. The goal was always to achieve high fire, so it gained the psychological high ground. When you mention mid-range, potters immediately think, as I initially did, of mid-range electric oxidation. But this is not the only way to fire mid-range. Mid-range reduction has a completely different look, as does mid-range oxidation soda firing or mid-range reduction soda firing. And finally, when you mention firing to mid-range, potters immediately want to change or convert their cone 10 glazes to this lower temperature. This is perceived as a significant challenge because it means that they will have to learn a glaze calculation software and unity molecular formulation. Most just want recipes that work. They know it will take time and effort to learn to convert all these recipes and they just don’t want to spend their time doing that. I don’t recommend converting glazes to the lower temperature, because when you lower the firing temperature of a glaze you are using different fluxing oxides that have different color responses. So although it is possible to convert your glaze to the lower temperature, you will end up with a different glaze anyway. 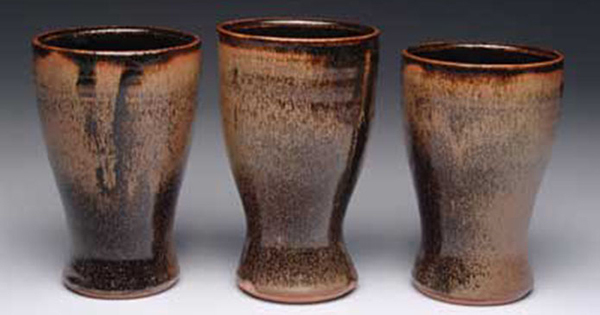 It is better to use the many tried and true mid-range glazes already in use and test them in your cycle. This is the same way potters find high-fire glazes; they get glaze recipes from books or from friends and then vary the colorants and opacifiers. Although change is hard, potters should focus on the benefits of firing mid-range reduction. First, as stated above, it saves fuel, reduces your carbon footprint and costs less. Second, it saves time. It may take 2-4 hours to get the extra temperature of cone 10 and maybe longer depending on the size of the kiln. So rather than firing for 10-12 hours you will be out in 8-10 hours. Firing to mid-range also reduces the wear and tear on your kiln, which means that it lasts longer. Finally, and most importantly, you get great results! After all this testing, we discovered that the methods used to test high-fire glaze types also apply to mid-range types and, as a result, we found some very nice glazes. Erik, Luba and the potters of MudFire Clayworks are proof of that. Hopefully, this will help other potters get started firing to mid-range reduction. Sodium Oxide (Na20) is a strong alkaline flux and creates brightly colored glazes. It has a melting point of 1652°F (900°C) and a high expansion/contraction rate, which will often cause crazing in glazes. It is often found in association with potassium oxide in feldspars. Common mid-range sources include sodium feldspars (nepheline syenite-actually a feldspathoid-is the lowest melting feldspar and so it is often used at midrange. It is high in sodium and lower in silica than other feldspars and melts around cone 6. ), soda ash, wood ash, borax, frits and Gerstley borate or its substitutes. Lithium Oxide (Li2O) is the lightest weight, smallest particle size and most powerful of the alkaline fluxes with a strong color response similar to sodium and potassium oxides. It has a melting point of 1472°F (800°C) and has a low expansion/contraction rate, which can cause shivering in glazes. Sources include lithium feldspars and lithium carbonate. Zinc Oxide (ZnO) is an auxiliary flux in oxidizing atmospheres. It has a dramatic color response, both good and bad, depending on the colorant. It can heighten colors with copper and cobalt oxides, but produces dull colors with chrome oxide. It has a melting point of 3587°F (1975°C), but if it is fired in reduction it will change to the metal zinc and volatilize at 1742°F (950°C). It has a low expansion/contraction rate, so it can help to reduce crazing. Sources include zinc oxide and calcined zinc oxide. Boron Oxide (B2O3) is a glass former and a flux with a molecular structure similar to alumina. It melts at 1292°F (700°C) but begins melting at 572°F (300°C). It has a low expansion/contraction rate and produces good color response in glazes, with characteristic bluish, milky streaks and cloudy effects. Sources include Gerstley borate (or its substitutes like Gillespie Borate, Murray’s Borate, Laguna Borate, etc. ), borax and frits. NOTE: Frits come in a wide range of types. They are used by industry as reliable and consistent sources of fluxing oxides in relatively insoluble form. They are relatively low in alumina and silica and are active melters, but they can settle rapidly. alkaline, alkaline fluxes, bentonite, chrome oxide, copper carbonate, crazing, glass former, high fire, lithium carbonate, low fire, mid range, oxidation, porcelain, reduce, reduction, set, shino glaze, shivering, strontium carbonate, tin oxide, zinc oxide. i am a potter in india and we do not get frit 3134.
please can you help me with a glaze receipe that does not include frit 3134. I hope my question gives you enough information. If you like I will post the Randy’s Red recipe that I use in ^6 oxidation. What can I expect from using Randy’s Red in ^6 reduction firing. The colorant is crocus martis. its glaze very good for me..thanks..
Panama red came out awesome ^6 Reduction – thanks John Britt and so did teadust !!!! Colleen, you can get a c/6 oxidation red using a combination of chrome and tin instead of copper. There are recipes out there, but I don’t know if I can plug any books or other websites here, so I won’t. Search the web for Lana’s Red; it’s my favorite c/6 ox red so far. Is chemistry still taught in school? Copper oxidation = Green. Copper reduction = Red. I have to admit I haven’t been involved in ceramics for 25 years. Had a studio and gallery for 15 years. 60 cu/ft hardbrick, crossdraft, gas fired kiln with wood side port for extra glaze effects. This is the first time in all these years that I have looked into what people are doing these days. I have to admit I’m a little disappointed. I had a subscription to CM back in those days, and when someone gave me a recent edition I was sorry to find that not much has changed since then. The only difference seems to be that no one learns where their materials come from. I had a professor and an Ozark cottage potter as my mentors. Please don’t let the science of pottery be lost. Learn your chemistry. Learn where the materials come from and how they work together. Dear Colleen, I see that your post is from September, so you may have already gotten the answer to this… the red happens as a result of reducing the oxygen starting at about cone 08 or 1737 degrees F.. this is one of the reasons why copper reds have long been considered so elusive.. at that point the flame becomes so hungry for oxygen that it pulls it out of the glaze and clay body.. turning the copper to red! If the reduction doesn’t happen at that point then one doesn’t get red and maybe gets green.. depending on the glaze ingredients.. Thanks AB- I am still pretty new to all of this. Does anyone have a recipe that would be somewhat red? (cone 6 ox)From everything I have tried…..I have all sorts of greens…lol…Am I asking the impossible? We fired it and got a nice red, remember it has to have reduction to get the red. In oxidation this is a beautiful transparent pale green. I made the Panama Red as printed above and got a pretty minty green???? What did I do or is Judy right and there is an error? Because of the many variables involved in glazes (clay body and glaze fit, variability in chemical content, temperature variability in kilns, organic materials, etc. ), we cannot guarantee food safety on the recipes posted on Ceramic Arts Daily. The best way to be certain is to have one of your finished pieces leach tested by a lab. I would also like to know if the Panama Red Glaze (cone 6) is food safe? I would also like an answer to the 2 above questions. Is this the corrected version of the recipe? I remember that the first printing was incorrect and the corrected version was in the next Ceramics Monthly magazine. I just found this website.. WOW!! Is the Panama Red glaze food safe?